Uniquely special water temperature of Dragon Hill Spa! You can experience our unique skin care 24 hours a day! You body will notice the difference before you know it. Looking for vibrant skin and anti-aging? You have come to the right place! Clean bedrock seawater obtained from 500m deep sea bedrock contains some 90 different types of minerals, sodium chloride and magnesium that help remove active oxygen within our body, and prevent oxidation and ultimately the aging process. 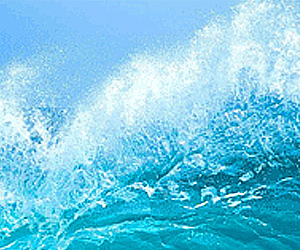 In addition, seawater is absorbed into the human body faster than regular water, accelerating metabolism and detoxification by discharging bodily waste, which, in turn, helps blood circulation and prevention of obesity. On top of it, the effect of revitalizing your skin tranquilizing mind through a variety of nutrition contained in green tea, including vitamin C, catechin, tocopherol and other minerals is combined with the thermal and sterilizing effects of clean seawater to provide you with healthy and vibrant skin as part of anti-the aging process. People complain of having less skin dirt in seawater but that’s because fat and skin dirt out of your body are dissolved by seawater. Do not use soap but take a shower with water only after taking a sea bath as your own fat remaining on your body will make you skin soft and smooth, not tight or stiff as you may feel when using soap. Do not use soap, shampoo, rinse, tonic water, liquid mousse and hair conditioner on your hair and body when taking a sea bath as they inhibits skin from becoming elastic and soft by blocking skin pores. Plunge your body into our hot bath and you will feel your body and heart wind down and relax, promoting blood circulation and muscle relaxation. It is particularly effective in preventing sudden increase of blood pressure for those who suffer from high blood pressure. 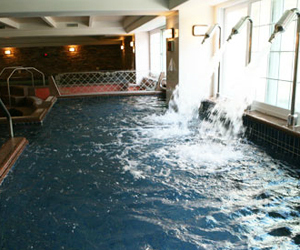 You will be able to enjoy in-water massage using water current of massage chair that stimulates thighs, sides and belly. Prevents sudden increase of blood pressure for those who suffer from high blood pressure. Promotes metabolism to relive fatigue and conform mind and body. Taking a cold bath following a hot bath contracts arteriovenous and lymphatic vessels to promote blood circulation, enhances skin resistance and to revitalize your mind and body. The hi-power jet of the Esthe Bath injects concentrative water pressure to blood circulation, activate subcutaneous tissues to the fullest and to help lose weight by facilitating decomposition of fat on desired parts of your body. In addition, cold bath gives a feel of tense to your sagged skin from hot bath to improve skin elasticity and restores your original bodyline. It also promotes metabolism to relieve fatigue and reduce stress. Do not plunge into cold bath immediately after hot bath. Your body needs time for adjustment. Make sure to take a shower and remove sweat before you take a bath. This is a massage bath where you can enjoy massage on your whole body through ergonomically designed whole body massage jet. It promotes blood flow, relives muscle fatigue, facilitates fat decomposition and helps with beauty case by decomposing unnecessary fats. Moderately-powered water massage using current vibration is perfect for those with muscle fatigue from repetitive physical exercise or work. Restrict the time of each bathing session to 10 minutes. Korean ginseng contains a variety of nutrition, including saponin, panacene, polyacetylene, and nicotinic acid that promote bodily functions, such as blood circulation and metabolism as well as detoxification, balance restoration of your body. It features oriental medicinal function that helps with preventing various diseases, reducing stress and enhancing self-healing capacity. 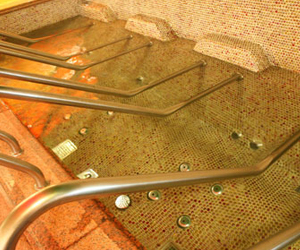 Repeat the process of shower-> sauna -> hot bath -> ginseng bath(5-10 minutes)-> rest on jade bed -> three times or more to obtain the optimal effect. They say hope and dreams are in lake at the end of a rainbow. Rainbow bath is designed to allow children to enjoy bath. 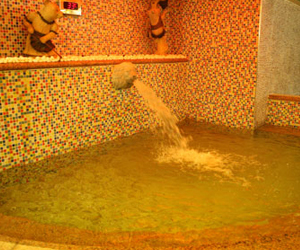 Rainbow bath is dedicated to children only with shallow bottom and moderately hot temperature. This is ideal for children who hate hot bath and are afraid of water. This is exclusively for children under the age of 7. This is an event bath customized to individual needs of customers with an aim to maintain optimal bio-rhythm and nutrition in accordance with change of four seasons. This seasonal bath uniquely provided by Dragon Hill Spa features extract of medicinal herbs in the bath to relieve your fatigue and stress. This is highly effective in restoring your healthy body and maintaining beauty. Chinese matrimony vine: Long-term consumption of Chinese matrimony vine strengthens your muscle and bone, revitalizes your body and slows down the aging process, extending your longevity. It is also highly effective in promoting blood circulation and treating high blood pressure, low blood pressure, and constipation. Jasmine bath: The scent of Jasmine is effective in improving skin elasticity, and treating endocrine system disorders such as cold constitution, stress ulcer etc. Ginseng bath: Oriental medicine society says ginseng bath warms up your body and is effective in relieving fatigue and shoulder discomfort, and treating cold. 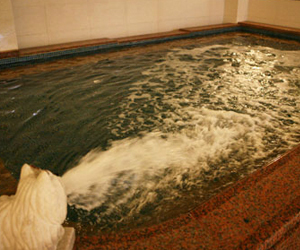 Coffee bath: Taking a coffee bath refreshes your mind due to caffeine in coffee. Coffee beans contain fat that helps soften you skin. Mugwort bath: Mugwort bath helps stop neuralgia. It is especially effective in treating heat rash, grass poison, shoulder discomfort, backache, neuralgia, rheumatism, sore muscles and gout. It also increases basic body temperature, which makes it ideal for women who complain of cold hands and feet or leukorrhea. 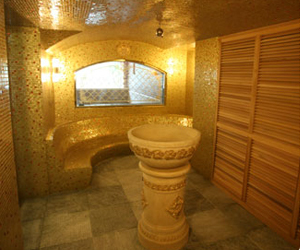 Pine leaf bath: Pine tree leaves are known as wild ginseng on a tree. They boost brain functions, reinforces heart and prevents arteriosclerosis. Rice wine bath: Wine bath makes alcohol absorbed into skin to protect your body, promote metabolism, recover from fatigue and prevent cold. It is also effective in treating shoulder discomfort, backache, skin vitalization and detoxification. 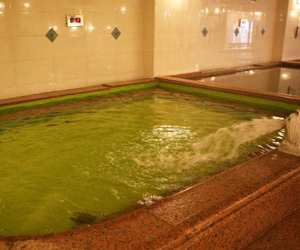 Herb bath: Combined with mineral water beneficial to skin health, herb bath provides aroma therapy, which is effective to discharge bodily waste or oil accumulated in pores and to expand blood vessels to recover from fatigue and speed up blood circulation. Repeat the process of shower-> sauna -> hot bath -> herbal tonic bath(5-10 minutes)-> rest on jade bed to obtain the optimal effect. Please note that oriental medicinal herbs may irritate sensitive or damaged skin. 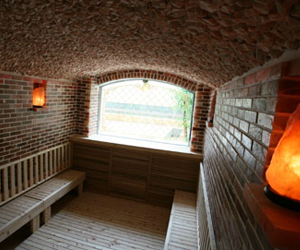 This sauna features aroma therapeutic mist at a moderate temperature unlike hot sauna, which helps with cardiorespiratory activities and tranquilizes your mind and body. Aroma essential oils boast of special treatment effect, which is expressed as the ‘energy or hormone of plant’. It helps restoring balance of your body by reinvigorating it and treating diseases, especially bronchial disorders as well as skin vitality. Indulge yourself into aroma wet sauna and foot massage to relive chronic fatigue and stress and to maintain healthy skin and body. Restrict the time of each bathing session to 15 to 20 minutes per attempt. Salt has long been regarded as the origin of life and is rapidly penetrated into our body to expand pores, through which bodily waste is discharged, softening your skin. Himalayan salt cleansed by sun and natural wind is rich in minerals and is effective in whitening, moisturizing and revitalizing your skin. Apply salt in sauna all over your body to get cellulite treatment and your clogged blood vessels will open and swollen body will be relieved. Far-infrared radiation emitted from salt helps treat women’s diseases, constipation, and stress while revitalizing your mind and body. 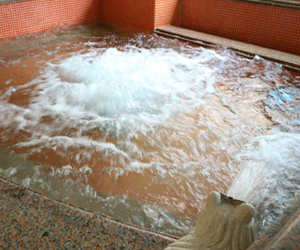 Restrict the time of each bathing session to 15 to 20 minutes. Make sure to take a shower and remove sweat before taking bath.